Holliston, MA—American Durafilm Co., Inc. announces the addition of a new professional-grade slitter to its production space. The machine will allow the company to rewind slit standard-length rolls in an effective and efficient manner. 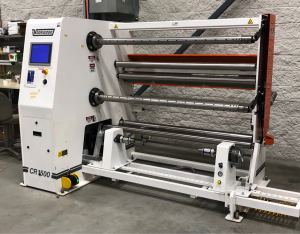 With the ability to process master rolls up to 500 pounds and rewind rolls of up to 250 pounds, the upgraded slitter enables American Durafilm to offer significantly improved roll formation in long-length slitting. American Durafilm provides slitting to any custom dimension and rewinding down to .75″ in width. High-tech and precise, the new slitter increases the company’s capacity to deliver quality finished product to customers. Through new equipment acquisitions and perpetual process improvements, American Durafilm will continue to grow and assert its authority as a market leader in providing and distributing high-performance films, polyimide tubing, and custom-coated products. For more information on American Durafilm and its capabilities, visit www.americandurafilm.com. an ISO 9001:2015 certified company, has more than 70 years of experience in providing solutions for a wide range of applications requiring high-performance films, coating, and tubing. Founded in 1949 as one of the three original Licensed Industrial Applicators of Teflon® brand coatings, over half a century later, the company remains a leading solutions provider of ultra-high-performance materials, coatings, and films, including Kapton®, Teflon®, and Tedlar®, as well as FEP rollcovers. Its Duralok™ technology offers the first and only resealable FEP and Kapton® bag. American Durafilm® can fabricate high-performance films to customer specifications, including processes for thermoforming, heat sealing, and die cutting. The company is well known for its responsive service and high-quality products, having received numerous awards from commercial and government customers for on-time performance and overall quality. Major functions of fabrication including heat sealing and assembly work, which can be performed onsite in their updated ISO 7/Class 10000 clean room facilities. In addition, American Durafilm® manufactures seamless polyimide tubing in ID sizes ranging from 0.005″ up to 2.50″. The Tubing Division provides laser machining, cut to length, necking, flaring, tipping, thermoplastic jackets, re-flow, and sub-assembly services.